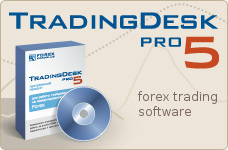 Trading Desk Pro's forex trading software windows based format allows easy navigation and customization of pages to suit your requirements. You can place market orders on real-time prices and execute your trade with a click of a mouse. You can set a "stop order" which can automatically close a trade if it reaches the value you specify, in case the market moves in the direction opposite of what you accepted. You can set a "limit order" which can close the trade when it reaches the profit value you are targeting. Any of these and other options can be changed at any time. And all of this is done through your Trading Desk Pro over the Internet in seconds. A comprehensive records of past and present trading activity enables you easily monitor positions and orders combined with margin account management. You have access to real-time charts for major FX instruments, and comprehensive charting facilities. There are different technical studies available, including: Moving Averages, Bollinger bands, RSIs, stochastics, Elliot waves etc..
You can also make and run your own indicators with our script language identical to EasyLanguage, or use your favorite indicators from TradeStation.